Note: This is the basic stock recipe for chicken ramen broth. Seasonings such as shio (salt), shoyu (soy sauce), miso, or hot sauce should be added to individual servings, not to the broth base. See below under Chicken Ramen Recipe for further details. The first step is to wash the pork bones and trotters well. To do this, place the pork bones and trotters in a very large stock pot or pressure cooker and fill with enough water to cover the bones. Then bring to a boil over high heat. Once a rolling boil has been achieved, allow the bones to cook for 10 minutes. You will see dark coloured gunk floating on the surface of the water. Discard the water, scrub off any gunk from the bones under cool running water, and wash the pot well. Place the clean bones into a very large and clean stock pot and add the chicken carcasses. Then add water until the water level reaches 1.5 inches below the top of the pot. Bring to a rolling boil over high heat. Then reduce the heat to maintain a medium to strong boil. You will see foam or more debris floating on the surface. Skim this off and discard periodically. Meanwhile, in a heavy bottomed, medium sized sauce pan, heat 1/2 an inch of vegetable oil over medium high heat. Once the oil is hot, add the ginger and head of garlic and fry until browned and shriveled up. Do not allow them to burn. Remove the ginger and garlic from the oil and add them to the stock pot. Then add the onions to the hot oil and fry until caramelized and browned. Do not allow the onions to burn. Remove the onions from the hot oil and add them to the stock pot as well. Boil the stock for at least 5 hours and up to a total of 8 hours. While you are boiling the stock, you will need to check the stock periodically and add water as needed. Most of the bones should be covered with water. By the end of the cooking time, the stock should be creamy white in colour, slightly thickened, and full of meaty flavour. Add salt to taste, but ideally, you want the soup to be underseasoned at this point, as you will be adding more seasonings to individual bowls of ramen prior to serving. Using tongs, remove and discard the bones. Strain the stock through a fine sieve into a different pot or bowl. Skim off the fat from the surface of the soup. 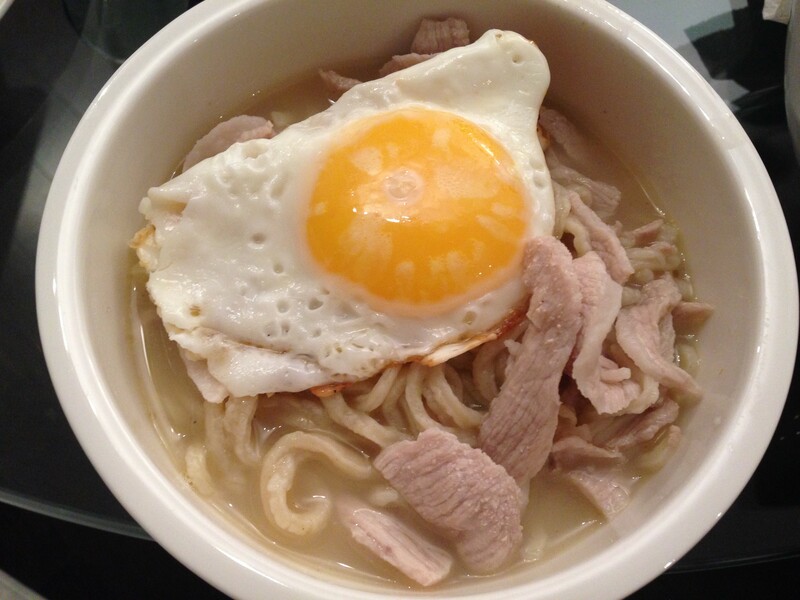 See the chicken ramen recipe below for instructions on how to assemble and serve individual bowls of ramen. Leftover broth should be stored in the refrigerator or the freezer. If you allow the broth to chill in the refrigerator, the fat will solidify at the top of the broth and will be easier to remove. Although, some people prefer to keep the fat for a richer broth. The frozen broth can be defrosted and then reheated or reheated from frozen. To assemble a delicious bowl of chicken ramen, you need to boil the ramen noodles (preferably fresh noodles), prepare your toppings, and heat up and season the broth. See below for details. Toppings vary greatly, so use whichever combination of condiments, vegetables, and meats that you like. Some examples include mayu (black garlic oil), finely minced fresh garlic, pickled bamboo, pickled ginger, black fungus, thinly sliced green onions, bean sprouts, corn, mushrooms (my favourite: enoki), toasted sheets of seaweed, ground white pepper, marinated soft boiled egg, thinly sliced pork jowl, cooked chicken, sliced chasu (Chinese BBQ pork), fish cake, etc. This is a great way to use up leftovers. To cook ramen noodles, bring a large pot of water to a rolling boil over high heat. Meanwhile, prepare and season the broth. Individual portions of chicken broth (recipe above) should be heated in sauce pot(s). I recommend one and a half to two cups of broth per serving. Seasonings of your choice should be whisked into the hot broth to taste. Options for seasonings include, but are not limited to, shio (salt), shoyu (soy sauce), miso, hot sauce, and/or tahini. Once the pot of water has reached a rolling boil, drop the ramen noodles gently into the boiling water and cover the pot with its lid until the water returns to a rolling boil. Then remove the lid, reduce the heat slightly to maintain a strong boil, and cook the noodles until the desired texture is achieved. I personally prefer my noodles to be softer than al dente, but still slightly chewy. See the packaging of the noodles for cooking time guidelines. Drain and place into individual bowls for serving. Pour the seasoned broth over the noodles. Then add the prepared toppings of your choice. If desired, add a very light drizzle of mayu (burnt garlic oil) to each bowl as well. Serve immediately.